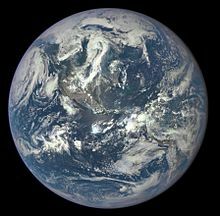 Earth is the third planet from the Sun and is the largest of the terr estrial planets in the Solar System, in both diameter and mass. Home to myriad species including humans, it is also referred to as "the Earth", "Planet Earth", "Gaia", "Terra", and "the World". For quotes specifically concerning the personification of Earth, oft called Mother Nature or Mother Earth, see Mother Nature. Note that there may invariably arise some justified overlap in the quotes between this page and that. And pleased with novelty, might be indulged. William Cowper The Task (1785), Book I, The Sofa Line 506. This poor world, the object of so much insane attachment, we are about to leave; it is but misery, vanity, and folly; a phantom, — the very fashion of which "passeth away." François Fénelon, reported in Josiah Hotchkiss Gilbert, Dictionary of Burning Words of Brilliant Writers (1895), p. 206. Облетев Землю в корабле-спутнике, я увидел, как прекрасна наша планета. Люди, будем хранить и преумножать эту красоту, а не разрушать её! Orbiting Earth in the spaceship, I saw how beautiful our planet is. People, let us preserve and increase this beauty, not destroy it! The Earth provides enough to satisfy every man's need but not for every man's greed. In the next century, planet earth will don an electronic skin. It will use the Internet as a scaffold to support and transmit its sensations. This skin is already being stitched together. It consists of millions of embedded electronic measuring devices: thermostats, pressure gauges, pollution detectors, cameras, microphones, glucose sensors, EKGs, electroencephalographs. These will probe and monitor cities and endangered species, the atmosphere, our ships, highways and fleets of trucks, our conversations, our bodies — even our dreams. Neil Gross, in "The earth will don an electronic skin" in BusinessWeek (30 August 1999). No matter where I go in the world, although I can't speak any foreign language, I don't feel out of place. I think of the earth as my home. If everyone thought this way, people might notice just how foolish international friction is, and they would put an end to it. We are, after all, at a point where it is almost narrow-minded to think merely in geocentric terms. Human beings have launched satellites into outer space, and yet they still grovel on earth looking at their own feet like wild dogs. What is to become of our planet? I have very large ideas of the mineral wealth of our Nation. I believe it practically inexhaustible. It abounds all over the western country, from the Rocky Mountains to the Pacific, and its development has scarcely commenced... Immigration, which even the war has not stopped, will land upon our shores hundred of thousands more per year from overcrowded Europe. I intend to point them to the gold and silver that waits for them in the West. Tell the miners from me, that I shall promote their interests to the utmost of my ability; because their prosperity is the prosperity of the Nation, and we shall prove in a very few years that we are indeed the treasury of the world. Abraham Lincoln, message for the miners of the West, delivered verbally to Speaker of the House Schuyler Colfax, who was about to depart on a trip to the West, in the afternoon of April 14, 1865, before Lincoln left for Ford's Theatre. Colfax delivered the message to a large crowd of citizens in Denver, Colorado, May 27, 1865. Reported in Edward Winslow Martin, The Life and Public Services of Schuyler Colfax (1868), p. 187–88. Archibald MacLeish, as quoted in Richard Milhous Nixon's First Inaugural Address (given January 20, 1969). What about all the peace that that you pledge your only son? What about flowering fields, is there a time? What about all the dreams that you said were yours and mine? Did you ever stop to notice all the children dead from war? Did you ever stop to notice the crying Earth, the weeping shores? Michael Jackson, "Earth Song" (1995). The earth, that's nature's mother, is her tomb. William Shakespeare, Romeo and Juliet (1597), Act II, scene iii. But to the earth some special good doth give. We are pilgrims, not settlers; this earth is our inn, not our home. John Heyl Vincent, reported in Josiah Hotchkiss Gilbert, Dictionary of Burning Words of Brilliant Writers (1895), p. 206. They know not what they do." Kurt Vonnegut, in A Man Without a Country (2005). We are here on Earth to fart around. Don't let anybody tell you any different. The surface of the earth is the shore of the cosmic ocean. On this shore we've learned most of what we know. Recently we've waded a little way out, maybe ankle-deep, and the water seems inviting. We’ve done such a rotten job managing our own planet, we should be very careful before trying to manage others. Carl Sagan, in "Watching the World", in Awake! magazine, (8 June 1999). Peter Schilling, song Major Tom (Coming Home) (1983). We travel together, passengers on a little space ship, dependent on its vulnerable reserves of air and soil; all committed for our safety to its security and peace; preserved from annihilation only by the care, the work, and, I will say, the love we give our fragile craft. We cannot maintain it half fortunate, half miserable, half confident, half despairing, half slave—to the ancient enemies of man—half free in a liberation of resources undreamed of until this day. No craft, no crew can travel safely with such vast contradictions. On their resolution depends the survival of us all. Adlai Stevenson, U.S. ambassador to the United Nations, last major speech, to the Economic and Social Council of the United Nations, Geneva, Switzerland (July 9, 1965); in Albert Roland, Richard Wilson, and Michael Rahill, eds., Adlai Stevenson of the United Nations (1965), p. 224. Leo Tolstoy, Resurrection (1899), translated by William E. Smith, ch. 83. The materials of wealth are in the earth, in the seas, and in their natural and unaided productions. The earth, that is sufficient, I do not want the constellations any nearer, I know they are very well where they are, I know they suffice for those who belong to them. Book of Enoch, Chapter 4, translated by Robert Charles, 1917. King James Version on Wikisource. David, Book of Psalms 37:11. And it came to pass, as he had made an end of speaking all these words, that the ground clave asunder that was under them: And the earth opened her mouth, and swallowed them up, and their houses, and all the men that appertained unto Korah, and all their goods. They, and all that appertained to them, went down alive into the pit, and the earth closed upon them: and they perished from among the congregation. And he will exalt you to take possession of the earth. When the wicked are done away with, you will see it. David, Book of Psalms 37:34. He is a lover of righteousness and justice. With the loving-kindness of Jehovah the earth is filled. But the nations became wrathful, and your own wrath came, and the appointed time came for the dead to be judged and to reward your slaves the prophets and the holy ones and those fearing your name, the small and the great, and to bring to ruin those ruining the earth.